For all the debate that's raged in Toronto over the so-called transit file — when did we all agree to call it that? — it's pretty remarkable that you don't hear more talk about the possibility of building a Downtown Relief Line. That the Ford camp has been able to place our collective attention squarely on Sheppard East in terms of subway development is actually quite the feat, especially when you consider that there's exactly the same amount of money reserved for both "projects" — which is to say nothing. As dumb as the subways vs. LRT debate is — and it's incredibly stupid to compare the two in the absence of contextual details like cost, population density, ridership projections, etc. — what's even more ridiculous is that this already problematic binary has somehow morphed into a subways on Sheppard East vs. LRT anywhere discussion. Torontoist Editor Hamutal Dotan has already done a good job in diagnosing this trend as its played out in terms of cost-based analysis — i.e. the Ford camp has successfully planted the (false) notion that if money is no option, subway infrastructure is necessarily better — but the other side of the coin is that our mayor has also managed to narrow the subway discussion to this one corridor of the city. That just doesn't make any sense. Yes, Ford campaigned on a subway extension for Sheppard and has made it one of his key mandates throughout his time in office, but when he cut his post-Transit City deal with Metrolinx — the now ill-fated memorandum of understanding (MOU) — funding for the Sheppard extension was left in the City's hands. Talk of an extension on Sheppard continued in the months that followed, fuelled by snippets of info from Gordon Chong's study of funding options for the line and the compromise plan TTC Chair Karen Stintz pitched before Ford's MOU with the province was eventually voted down at council. One of the significant developments over this period was the entrance of "alternative revenue sources" into the conversation — you know, things like a parking tax or road tolls. These tools are, in fact, still on the table in some capacity or another as tomorrow's council meeting looms. And that's perhaps what's most problematic about all this. If we're going to consider revenue sources of this nature, we'd best collectively consider directing them toward a transit project that actually makes sense. Given that LRT is the overwhelmingly obvious choice for Sheppard, that means it's time to start talking about a DRL. At the very worst, it would curb all this inane talk about how world-class cities build subways. Many of the very cases made for building a subway extension on Sheppard would better justify the construction of a DRL. 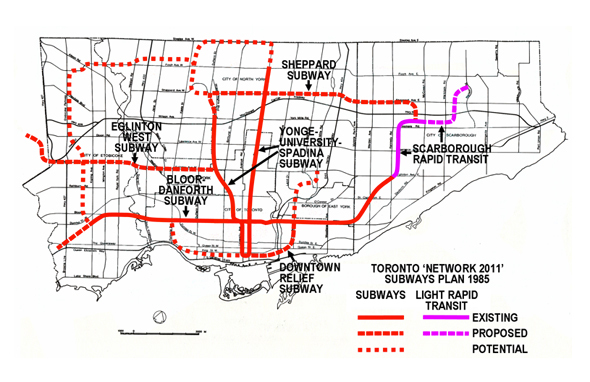 Sheppard subway supporters are fond of touting just how long plans have been around to build the line further east to Scarborough, but so too have plans for a DRL, which can also be traced back to the now tauntingly named Network 2011 project. Given our current funding scenarios and ridership projections, the case for pursuing the latter project is far stronger. Don't believe me? Matt Elliott at Ford for Toronto has already laid out the pragmatics lucidly and convincingly. "Unlike Eglinton & Sheppard, the TTC's ridership projections for this route have actually increased since they were first made in 1986," he explains. "With 13,000 riders per hour in the peak direction, the DRL would open with ridership very close to subway minimums and, more importantly, would serve as a relief valve for the overburdened Yonge line, solving one of the most pressing issues facing Toronto's transit system. The line would provide new service to dense neighbourhoods while simultaneously having a positive network impact." One of the best recent cases for a DRL comes courtesy of Bert Archer at the Toronto Standard. Although he actually floats the idea that Ford might be right about a Sheppard subway extension, Archer's arguments (via Mark Osbaldeston's Unbuilt Toronto books) about Toronto's inability to pull the trigger on grand projects work marvellously in favour of DRL. "Cities are not businesses," he writes. "They do not need to show a profit, or even break even. They are, unlike businesses, meant to be around for centuries, and are meant to serve their population. This is often expensive, with today's governments needing to make commitments on future generations' behalf." By this rationale — and with particular emphasis on the idea of infrastructure that serves the population — it's high time we started talking more seriously about a Downtown Relief Line, a project that would be both practical and grand at the same time.